The following is a transcript of Mitt Romney’s remarks addressing the candidacy of Donald J. Trump, as transcribed by the Federal News Service. ROMNEY: Thank you. Thank you. (APPLAUSE) Thank you, Jason, and thank you to the Hinckley Institute, Governor Herbert, Lieutenant Governor, President, it’s good to be with you today. Now, I’m — I’m not here to announce my candidacy for office. And I’m not going to endorse a candidate today. Instead, I would like to offer my perspective on the nominating process of my party. Back in 1964, just days before the presidential election — which, incidentally, we lost — Ronald Reagan went on national television and challenged America, saying that it was a time for choosing. He saw two paths for America, one that embraced conservative principles, dedicated to lifting people out of poverty and helping create opportunity for all. And the other, an oppressive government that would lead America down a darker, less free path. I’m no Ronald Reagan and this is a different moment in time, but I believe with all my heart and soul, that we face another time for choosing, one that will have profound consequences for the Republican Party, and more importantly, for our country. I say this, in part, because of my conviction that America is poised to lead the world for another century. Our technology engines, our innovation dynamic, the ambition and skill of our people are going to propel our economy and raise the standard of living of Americans. Now, that doesn’t mean we don’t have real problems and serious challenges. We do. At home, poverty persists. And wages are stagnant. The horrific massacres of Paris and San Bernardino. The nuclear ambitions of the Iranian mullahs. The aggressions of Putin. The growing assertiveness of China and the nuclear tests of North Korea confirm that we live in troubled and dangerous times. On the other hand, if we make improvident choices, the bright horizon I’ve described will not materialize. And let me put it very plainly. If we Republicans choose Donald Trump as our nominee, the prospects for a safe and prosperous future are greatly diminished. Let me explain why I say that. First on the economy. If Donald Trump’s plans were ever implemented, the country would sink into prolonged recession. A few examples. His proposed 35 percent tariff-like penalties would instigate a trade war and that would raise prices for consumers, kill our export jobs and lead entrepreneurs and businesses of all stripes to flee America. His tax plan in combination with his refusal to reform entitlements and honestly address spending would balloon the deficit and the national debt. So even though Donald Trump has offered very few specific economic plans, what little he has said is enough to know that he would be very bad for American workers and for American families. But you say, wait, wait, wait, isn’t he a huge business success? Doesn’t he know what he’s talking about? No, he isn’t and no he doesn’t. Look, his bankruptcies have crushed small businesses and the men and women who work for them. He inherited his business, he didn’t create it. And whatever happened to Trump Airlines? How about Trump University? And then there’s Trump Magazine and Trump Vodka and Trump Steaks and Trump Mortgage. A business genius he is not. Now, not every policy that Donald Trump has floated is bad, of course. He wants to repeal and replace Obamacare. He wants to bring jobs home from China and Japan. But his prescriptions to do those things are flimsy at best. At the last debate, all he could remember about his health care plan was to remove insurance boundaries between states. Successfully bringing jobs home requires serious policy and reforms that make America the place businesses want to come, want to plant and want to grow. You can’t punish business into doing what you want. Frankly, the only serious policy proposals that deal with a broad range of national challenges we confront today come from Ted Cruz, Marco Rubio and John Kasich. One of these men should be our nominee. (APPLAUSE) Now, I know that some people want this race to be over. They look at history and say a trend like Mr. Trump’s isn’t going to be stopped. Perhaps. But the rules of political history have pretty much all been shredded during this campaign. If the other candidates can find some common ground, I believe we can nominate a person who can win the general election and who will represent the values and policies of conservatism. Given the current delegate selection process, that means that I’d vote for Marco Rubio in Florida and for John Kasich in Ohio and for Ted Cruz or whichever one of the other two contenders has the best chance of beating Mr. Trump in a given state. Now let me turn to national security and the safety of our homes and loved ones. Mr. Trump’s bombast is already alarming the allies and fueling the enmity of our enemies. Insulting all Muslims will keep many of them from fully engaging with us in the urgent fight against ISIS, and for what purpose? Muslim terrorists would only have to lie about their religion to enter the country. And then what he said about on “60 Minutes”. Did you hear this? It was about Syria and ISIS, and it has to go down as the most ridiculous and dangerous idea of the entire campaign season. Let ISIS take out Assad, he said, and then we can pick up the remnants. Now, think about that. Let the most dangerous terror organization the world has ever known take over an entire country? This recklessness is recklessness in the extreme. Now, Donald Trump tells us that he is very, very smart. I’m afraid that when it comes to foreign policy he is very, very not smart. Now, I’m far from the first to conclude that Donald Trump lacks the temperament to be president. After all, this is an individual who mocked a disabled reporter, who attributed a reporter’s questions to her menstrual cycle, who mocked a brilliant rival who happened to be a woman due to her appearance, who bragged about his marital affairs, and who laces his public speeches with vulgarity. Donald Trump says he admires Vladimir Putin, at the same time he has called George W. Bush a liar. That is a twisted example of evil trumping good. There is a dark irony in his boasts of his sexual exploits during the Vietnam War. While at the same time, John McCain, whom he has mocked, was imprisoned and tortured. Dishonesty is Donald Trump’s hallmark. He claimed that he had spoken clearly and boldly against going into Iraq. Wrong. He spoke in favor of invading Iraq. He said he saw thousands of Muslims in New Jersey celebrating 9/11. Wrong. He saw no such thing. He imagined it. He’s not of the temperament of the kind of stable, thoughtful person we need as a leader. His imagination must not be married to real power. The president of the United States has long been the leader of the free world. The president and, yes, even the nominees of the country’s great parties helped define America to billions of people around the world. All of them bear the responsibility of being an example for our children and our grandchildren. Think of Donald Trump’s personal qualities. The bullying, the greed, the showing off, the misogyny, the absurd third grade theatrics. You know, we have long referred to him as “The Donald.” He’s the only person in the entire country to whom we have added an article before his name, and it was not because he had attributes we admired. Now, imagine your children and your grandchildren acting the way he does. Would you welcome that? Haven’t we seen before what happens when people in prominent positions fail the basic responsibility of honorable conduct? We have. And it always injures our families and our country. Watch, by the way, how he responds to my speech today. Will he talk about our policy differences? Or will he attack me with every imaginable low road insult? This may tell you what you need to know about his temperament, his stability and his suitability to be president. Of course, a Trump nomination enables her victory. And the audio and video of the infamous Tapper-Trump exchange on the Ku Klux Klan will play 100,000 times on cable and who knows how many million times on social media. There are a number of people who claim that Mr. Trump is a con man, a fake — thank you. Let me say that again. There’s plenty of evidence that Mr. Trump is a con man, a fake. Mr. Trump has changed his positions not just over the years, but over the course of the campaign. And on the Ku Klux Klan, daily for three days in a row. We will only really know if he’s a real deal or a phony if he releases his tax returns and the tape of his interview with The New York Times. I predict that there are more bombshells in his tax returns. I predict that he doesn’t give much, if anything, to the disabled and to our veterans. I predict that he told The New York Times that his immigration talk is just that — talk. And I predict that despite his promise to do so, first made over a year ago, that he will never ever release his tax returns. Never — not the returns under audit; not even the returns that are no longer being audited. He has too much to hide. Nor will he authorize the release of the tapes that he made with The New York Times. If I’m right, you’ll have all the proof you need to know that Donald Trump is indeed a phony. Attacking me as he surely will won’t prove him any less of a phony. It’s entirely in his hands to prove me wrong. All he has to do is release his back taxes like he promised he would and let us hear what he said behind closed doors to The New York Times. You know, Ronald Reagan used to quote a Scottish philosopher, who predicted that democracies and civilizations wouldn’t last much longer than a couple hundred years. And John Adams wrote this, “Remember, democracy never lasts long; it soon wastes, exhausts and murders itself. There never was a democracy yet that did not commit suicide.” That’s John Adams. I believe that America has proven these dire predictions wrong for two reasons. First, we’ve been blessed with great presidents, with giants among us. Men of character, integrity and selflessness have led our nation from the very beginning. None were perfect. Each surely made mistakes. But in every case, they acted out of the desire to do what was right for America and for the cause of freedom. The second reason is because we’re blessed with a great people — people who at every critical moment of choosing have put the interests of the country above their own. These two things are related. Our presidents time and again have called on us to rise to the occasion. John F. Kennedy asked us to consider what we could do for our country. Lincoln drew upon the better angels of our nature to save the union. I understand the anger Americans feel today. In the past, our presidents have channeled that anger and forged it into resolve, into endurance and high purpose, and into the will to defeat the enemies of freedom. Our anger was transformed into energy directed for good. Mr. Trump is directing our anger for less than noble purposes. He creates scapegoats of Muslims and Mexican immigrants. He calls for the use of torture. He calls for killing the innocent children and family members of terrorists. He cheers assaults on protesters. He applauds the prospect of twisting the Constitution to limit First Amendment freedom of the press. This is the very brand of anger that has led other nations into the abyss. He’s playing the members of the American public for suckers. He gets a free ride to the White House and all we get is a lousy hat. His domestic policies would lead to recession. His foreign policies would make America and the world less safe. He has neither the temperament nor the judgment to be president and his personal qualities would mean that America would cease to be a shining city on a hill. I’m convinced America has greatness ahead. And this is a time for choosing. God bless us to choose a nominee who will make that vision a reality. Former 2012 Republican Presidential nominee Mitt Romney lasted to round two in his celebrity boxing match with Evander Holyfield on Friday evening, May 15, 2015, which raised more than $1 million for CharityVision, that cures blindness in developing countries. 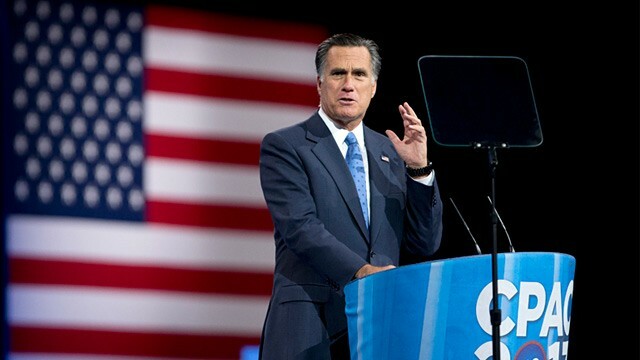 The match has kept Romney in the public eye even after he decided not to run again for the Republican presidential nomination. Let me begin by letting you know who else is on this call, besides Ann and me. There are a large number of people who signed on to be leaders of our 2016 finance effort. In addition, state political leadership from several of the early primary states are on the line. And here in New York City, and on the phone, are people who have been helping me think through how to build a new team, as well as supporters from the past who have all been kind enough to volunteer their time during this deliberation stage. Welcome, and thank you. Your loyalty and friendship, and your desire to see the country with new, competent and conservative leadership warms my heart. After putting considerable thought into making another run for president, I’ve decided it is best to give other leaders in the Party the opportunity to become our next nominee. Let me give you some of my thinking. First, I am convinced that with the help of the people on this call, we could win the nomination. Our finance calls made it clear that we would have enough funding to be more than competitive. With few exceptions, our field political leadership is ready and enthusiastic about a new race. And the reaction of Republican voters across the country was both surprising and heartening. I know that early poll numbers move up and down a great deal during a campaign, but we would have no doubt started in a strong position. One poll out just today shows me gaining support and leading the next closest contender by nearly two to one. I also am leading in all of the four early states. So I am convinced that we could win the nomination, but fully realize it would have been difficult test and a hard fight. I also believe with the message of making the world safer, providing opportunity to every American regardless of the neighborhood they live in, and working to break the grip of poverty, I would have the best chance of beating the eventual Democrat nominee, but that is before the other contenders have had the opportunity to take their message to the voters. I believe that one of our next generation of Republican leaders, one who may not be as well known as I am today, one who has not yet taken their message across the country, one who is just getting started, may well emerge as being better able to defeat the Democrat nominee. In fact, I expect and hope that to be the case. I feel that it is critical that America elect a conservative leader to become our next president. You know that I have wanted to be that president. But I do not want to make it more difficult for someone else to emerge who may have a better chance of becoming that president. You can’t imagine how hard it is for Ann and me to step aside, especially knowing of your support and the support of so many people across the country. But we believe it is for the best of the Party and the nation. I’ve been asked, and will certainly be asked again if there are any circumstances whatsoever that might develop that could change my mind. That seems unlikely. Accordingly, I’m not organizing a PAC or taking donations; I’m not hiring a campaign team. I encourage all of you on this call to stay engaged in the critical process of selecting a Republican nominee for President. Please feel free to sign up on a campaign for a person who you believe may become our best nominee. I believe a Republican winning back the White House is essential for our country, and I will do whatever I can to make that happen. To all my supporters, friends and family who worked both tirelessly and loyally to support my campaigns in the past, I will always be deeply appreciative. What you have already done is a tribute to your patriotism. We are overwhelmed and humbled by your loyalty to us, by your generosity of spirit, and by your friendship. God bless you all. Political Musings January 13, 2015: GOP 2016 Romney vs Bush, Paul Ryan out, Romney decided on presidential run? GOP 2016 Romney vs Bush, Paul Ryan out, Romney decided on presidential run? Political Musings August 29, 2014: Romney opens door, will it be Mitt vs Hillary Clinton in 2016 campaign? Romney opens door, will it be Mitt vs Hillary Clinton in 2016 campaign? President Obama has finally thanked Jimmy Carter’s grandson for helping him win the 2012 presidential election. President Obama and former rival Mitt Romney “pledged to stay in touch” after their hour-long lunch at the White House on Thursday, their first face-to-face encounter since the election. “The focus of their discussion was on America’s leadership in the world and the importance of maintaining that leadership position in the future,” according to the White House.